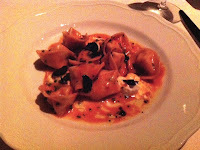 Famed Philadelphia restaurateur Stephen Starr opened one of his latest endeavors - Il Pittore - last October. It took over the tall, skinny space vacated by Noble American Cookery on 20th & Sansom. The food at Il Pittore was very good. The service was phenomenal. The prices were steep. I'll start with the service because we spent most of the walk home talking about it. Our waiter was very attentive and friendly, and he really knew the wine list. He even offered Bradd a taste of two different wines based on a description of what he liked (this rarely happens, if ever). When I wanted to order another cocktail - the Rye Smash btw is a great choice for spring/summer - all I had to do was turn my head around and another waiter was there in a snap to ask what I needed. Most impressive, when each dish was delivered from the kitchen, whoever brought it (usually not even a waiter) repeated all the ingredients from the menu to remind us of what we were about to eat. How nice! Who really remembers all the details after you order? Great way to re-energize us before each course. At Il Pittore's prices, this level of service should be standard. We also spent the ride home from Mica talking about the service, but because it failed to meet our expectations given the restaurant's caliber and prices. On to the food... Even though the staff encourages ordering an antipasti, primi and secondi each, you can share the antipasti because you'll eat plenty in the end, and it will save a few dollars. 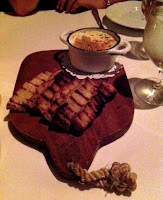 I shared the baked ricotta with apples, thyme and grilled foccacia ($12) with a friend. Tart apples were a perfect complement to the soft ricotta and crusty bread. It was plenty big enough; even our husbands were able to eat some. Bradd also had the braised octopus with picked sweet peppers ($15) and enjoyed that very much. For a primi, I chose lobster-filled tortellini with chives, black truffle and burrata ($18). It's pretty small for that price; I guess we should expect that as a primi. The dish was light and yummy, but the sauce could have been more flavorful. Bradd got the Amatriciana spaghetti with tomato, guanciale and hot pepper ($16). It was also good, but didn't knock his socks off. One of our friends got the paparadelle with wild boar and vouched that it was delicious. 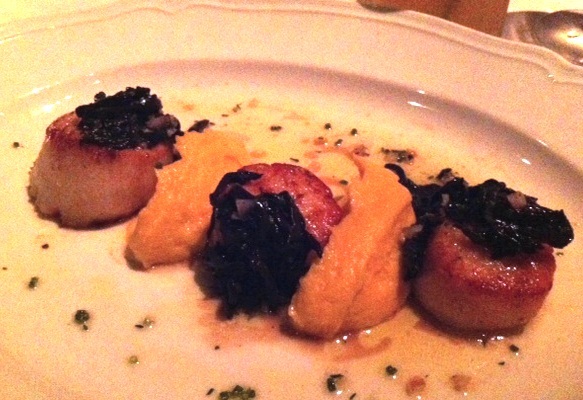 As a secondi dish, the Capesante E Funghi, or pan-seared diver scallops and acorn squash sformata with a warm chanterelle mushroom vinaigrette ($26) was also solid but not the best scallops I've ever had. Bradd, on the other hand, raved for the rest of the night about the Maialini a Fuoco Lento, or slow-cooked suckling pig ($31). I wish the photo came out better so you could see the presentation. It basically looked like a square mille feuille with layer upon layer of delicious, thin cut suckling pig. Highly recommend it! For dessert, you can't go wrong with the chocolate bombolini ($8) simply because anything with Nutella filling is amazing. Last important note: If you're like me, and would rather be outside or near windows eating lighter fare during spring/summer nights, don't let Il Pittore's second floor dining room turn you off. The decor, including large skylights lined with lush greenery, give it a very open and airy feeling even though you're inside. 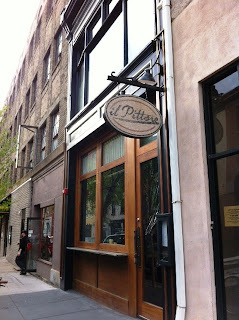 Overall, Il Pittore gave an A- performance for Stephen Starr, with service as the highlight. The food was all very good, but it does reminds you why, when it comes to pasta, Marc Vetri earns an A+. Now, if you haven't done any math yet, this was a $55 - $65 meal each, plus drinks. Most of Il Pittore's cocktails and wines by the glass, I'll add, are a few dollars more than you find at most Philly restaurants. So, you might want to reserve Il Pittore for a special night out but we do think it is well worth the visit.